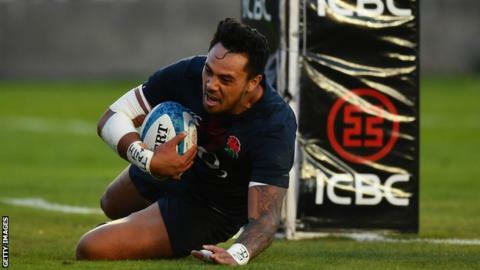 Sale winger Denny Solomona believes another England chance will come if he continues to deliver for his club. The 23-year-old was sent home from a pre-season training camp in August along with Leicester's Manu Tuilagi because of "team culture issues". England will play autumn internationals against Argentina, Australia and Samoa in November. "I don't think anyone is cemented in that squad," said Solomona, who has six scored tries in seven games this term. "If you are not performing for your club then you probably won't get the call-up. I have got to do my job here at Sale. "I am not too focused on the past, only on the present and the future. I am trying to perform for my club and that will get me a chance to represent my country as well." Solomona, who controversially switched from rugby league to union last year, scored the winning try on his England debut against Argentina in June. England head coach Eddie Jones said in September he was willing to recall both Solomona and Tuilagi "if their attitudes were right". Both players were believed to have gone out drinking in August and contravened the team's standards of behaviour. During the camp, the England players went out as a squad to dinner and returned to their hotel as a group. It is understood Tuilagi and Solomona then left the hotel for a second time, returning in the early hours of the morning, thought to be 04:00 BST.